Designed by America's most renowned crankbait fisherman, David Fritts, the GetRback lure retriever does exactly what is says, it gets your lure back when lodged in underwater structure. Easy to use, the GetRback lure retriever has been tested in the toughest underwater obstruction with great recovery success. 1. Attach GetRback lure retriever to line, and drop down to lure, keeping line taut. 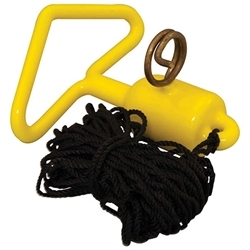 If this does not knock lure free, tug gently on rope to move back and forth along line. 2. If further effort is required, tilt your rod up and down to catch hooks on retriever bar, then pull on rope to free your bait.